Can you guess what this appetizer is before scrolling down? It was very tasty! After hours spent shoveling our way out of the house and snowblowing the driveway so we could get to our cars only to then have to dig them out, a lunch invitation from a friend sounded just perfect! The upside to living on a main road is that our street is plowed earlier than others after a snowstorm (the downside – traffic and noise pollution). So with the driveway cleared enough to get out, the next question was, which food spots are open today? After some brainstorming and a few phone calls we decided to head over to Marisa’s Ristorante. Not only do we love Marisa’s, but they were also open and their parking lot is cleared of snow. Marisa’s has been one of our go-to restaurants over the years. Italian food is one of my favorites, so I am always looking for new places to get my fix. If you like Italian then Marisa’s is one you need to add to your restaurant rotation. Family-owned and run, Marisa’s is a large restaurant with two large dining rooms essentially connected by a bar area which includes its own separate seating. Happy Hour is fun here, but it can get very crowded. Marisa’s has the space for you to host private parties of all different sizes, which we have done not too long ago. We also like to come in for date night, or to share a meal with friends. They are great for takeout if you live close enough, and their pizza is yummy.The staff is always friendly and very accomodating whether you are hosting a party, having dinner, or coming in for lunch after a blizzard like we did today! The decor of Marisa’s is unique in the sense that each dining room is decorated differently: the newer dining room, called the “Murano Room,” is decorated in red – red leather chairs, red drapes, red light fixtures, whereas the original dining room has a more traditional feel with dark wood, neutral colored walls, and brown leather chairs similar to the seating area in the bar. The red dining room is also where Marisa’s regularly holds a variety of entertainment – from comedy shows to DJ’s to local bands. We’ve even celebrated St. Patrick’s Day here before. What should you order to eat when you come to Marisa’s? I’ve yet to find something I don’t like on the menu, and it is an extensive menu. There is essentially something for everyone, including the kids. Your biggest problem will most likely be deciding what you want to eat. The “Bar Menu” include items you would expect such as burgers, nachos, fried mozzarella, and wings, however the menu also includes items beyond the standard bar fare. There is a filet mignon sandwich with red onions, horseradish sauce and fries and variety of salads and wraps. The “Small Plate” menu is large enough that you have plenty of variety for an appetizer course. Some of the options (yes, some) include: Lobster Arancini (rice balls), Filet Tips, Steamed Clams Casino, Jumbo Crab Cake, Beef Carpaccio, Shrimp Cocktail, Baby Lamb Chops, House Potato Chips, and the Philly Cheese Steak Springroll. 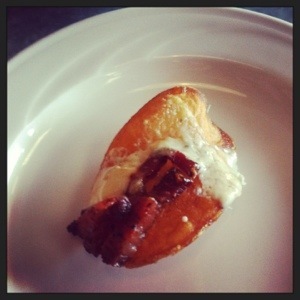 Have you figured out what one of our appetizers was today? Here’s a larger picture of the House Potato Chips. 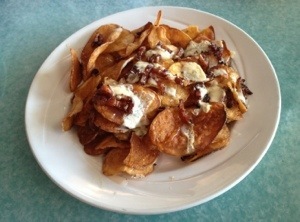 These homemade, crunchy potato chips are lightly covered in a white balsamic glaze, gorgonzola cheese, and slab bacon. The slab bacon adds a great flavor and different texture being a little chewy due to its thickness, and you can’t go wrong with gorgonzola. The balsamic glaze almost has the consistency of honey, yet not as sticky. The chips are not slathered with the toppings which keeps the entire plate of chips crisp; the bottom layers do not get soggy. So if you prefer to have your chips thoroughly covered, I’d suggest you order the House Potato Chips with extra topping. 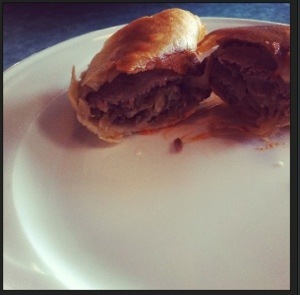 Our second appetizer today was the Philly Cheesesteak Springroll. The first time I ordered these was when I stopped by for happy hour with a friend a few months ago. They are one of her favorite appetizers at Marisa’s, and now one of my favorites! Think of a philly cheesesteak – thinly sliced pieces of steak with melted provolone and grilled onions – and now imagine them inside a crisp, fried shell. This appetizer is the perfect size for one person or for two to share. 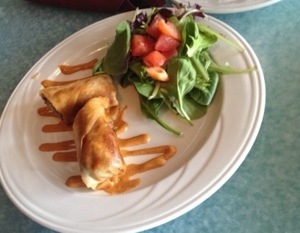 Accompanied by some mixed greens, the Philly Cheesesteak Springroll is served with a homemade cheese sauce and chipolte mayo which pairs perfectly with the spring rolls. Our lunch entrees? Well, it was a comfort food kind of day, and that means PASTA. If anyone were to ask me where to get a great vodka sauce, aside from my Italian friends and an aunt who make an amazing sauce (or gravy), I’d send you to Marisa’s for their FAMOUS vodka sauce. 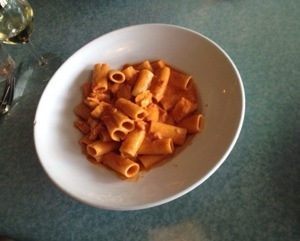 They do it a litle differently at Marisa’s, vodka sauce is served over rigatoni. You can also add grilled chicken or shrimp. Today our friend and I both enjoyed Rigatoni Pasta in Vodka Sauce with chicken. Lots of yummy food noises were made while we were eating lunch. You know, those “yummmms” and “oooooos” most people make when they’re eating delicious food, the kind of food you order again on your next visit, the kind of food you recommend others try. My husband ordered the Cavatelli, and for someone who does not prefer to eat pasta regularly like I do (I’d eat it several times a week if given the option), I think it says a lot that he likes to order the cavatelli at Marisa’s. Made with roasted tomatoes, fried hot peppers, fresh mozzarella, and a chicken cutlet, the Cavatelli is a delicious combination of ingredients and flavors most people like. Plus, the chicken cutlet is cooked perfectly and you can taste how fresh the mozzarella is. 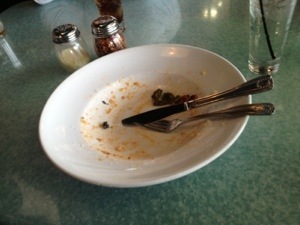 I ended up having a bite of the dish because you must share a few bites when your meal is that good! 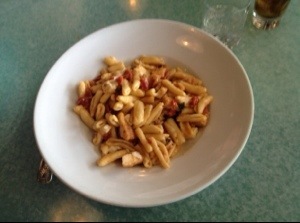 Our lunch entrees are off the “Dinner Pasta menu” which also includes gnocci, lasagna, linguine with fresh clams among many other choices. In fact, I have so many favorite dishes at Marisa’s it is impossible for me to do them all justice in this one post, so be on the lookout for more reviews in the future. TIP: If you dine at Marisa’s on Sunday, the “Dinner menu” is what is available all day, and that means dinner prices all day. Looking to buy Girl Scout cookies? There’s an app for that!